Award for Love and Kindness. The wonderful Tazein Mirza Saad at http://transcendingbordersblog.wordpress.com/ has been kind enough to nominate me for yet another award. In most instances I’m quite sure people chose me in error, in this case I’m convinced there can be no other reason. I’m a big believer in these awards as recognition between bloggers of the effect people have on each other whether it be to make people laugh or to be an agent for good in bringing to out notice some causes we may otherwise miss. They’re an encouragement to be better an to do better. That’s not to say I don’t understand why some people choose not to accept them and/or feature them. Having said that, see no reason for not letting those people know that I recognise their value and worth as bloggers. This latest one is called The Award for Love and Kindness so you’ll understand my questioning whether Tazein has been getting enough sleep or perhaps knows more than one David. 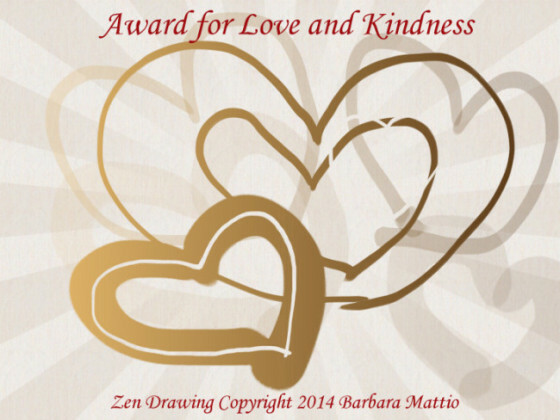 The Award for Love and Kindness. 1-Share an act of kindness another blogger has done for you. 2-Thank the person who nominated you and link back to their blog. Nominate those bloggers whom you feel practice kindness and love, you choose how many! The astounding Niamh Clune of http://ontheplumtree.wordpress.com was in contact frequently during the time my wife was ill and after she died. She was always very supportive as a friend which was appreciated but she also had the ability o detect the times when I was at rock bottom and my mental health was not at it’d best. She made efforts, without acknowledging the problem, to keep me going and on an even keel. That I’m here now may be due in no small part to her support. Thank you Niamh. ( Though my readers may not feel the same way). Thank you Tazein for your kindness. It’s great to know people like that, David. From what I know, you deserve the award. You’re too kind Mary J. Things like this should got o those who brighten the world one day at a time. You are genuinely kind, so you deserve it. That’s an amazing thing to say since you spend so much of your time highlighting the unnecessary cruelty of others and bringing inequalities to our attention. I think that is more a kindness than things I do. I’d include you for an award nomination in a flash if I thought you’d accept such a thing. If you ever feel like accepting then please count yourself nominated without hesitation. CONGRATULATIONS, DAVID! You are very worthy of this award! That was a lovely story, David. As everyone said — you really do deserve the “Love and Kindness” award. Why do I get a lump i the throat Teagan? I am truly stunned that you should offer me such recognition for something that I am completely unaware of. I have always thought you a perfect gentleman in every way, My heart went out to you and your family when your wife was ill and dying. You bore it all with such dignity. Nothing any of us could have said or done could have helped you through what must be the worst thing that could happen to anyone. My deepest, but shocked gratitude. You lifted my spirits on more than one occasion with your kindness.This gave me a perfect opportunity to say Thank You and recognise your kindness. You deserve it David. Huge hugs! Thanks so much Lori. There are so many more deserving people. Congratulations, Lord D! Another well-deserved award. Perhaps you don’t truly understand how deeply you have touched others. Whilst I truly appreciate the gesture K.D. I do think there are people out there who do bring joy and happiness to others. Who highlight the problems of others and offer support. Awards like this belong to them. That’s a beautiful thing to say Dianne. I’m beginning to feel very humbled by all the nice things being said. I just don’t see it I’m afraid when there are really nice people out there. I just don’t understand it Olga though I do appreciate it. There are people like you out there blogging who are much more entitled. Had I the time my list could have been a mile long. Now that is definitely one I would never qualify for! Although I did have someone describe me as a kindly and thoughtul soul the other day, I informed her she had obviously confused me with someone else. As for me, any kindness is directed at any vulnerable and weaker group. Doesn’t matter whether they are people (insert all people who are discriminated against) or animals. With people, I normally go for old and homeless, not necessarily both. But no-one loves them. Having your own views, respecting others, and visiting so many other blogs is no mean achievement. I can’t agree with you. Having seen some of your posts on the vulnerable in society I think you quality much more than me.You post fairly regularly on such subjects, the rights of women to equality, the gay, Gypsies, Spaniards on the Rock all kinds of discrimination that shouldn’t happen. That you call a spade a spade doesn’t make a difference to your kindness and the good you do. Just about perfect for an award like this in my eyes. ps. Having the patience to deal with my hugs alone puts you right in the category of kind- or mental? Hi David, firstly congratulations on your award, very deserving! Personally I love your comments you leave after each story I post on my blog. They are always so personal, caring and shows that you have taken the time to read my story. Enjoy this award, you deserve it! Thank you so many times Kim. Reading your blog is always a pleasure and hearing how you all are. I think the retort when I was a kid was, It takes one to know one ( or in your case two). Your Award is well deserved, David! Thank you Margaret. Some of these are a little overwhelming. You’re an angel. Misguided, but still an angel. No more so than you and others Ella but it’s a wonderful thing to say, thanks so much.